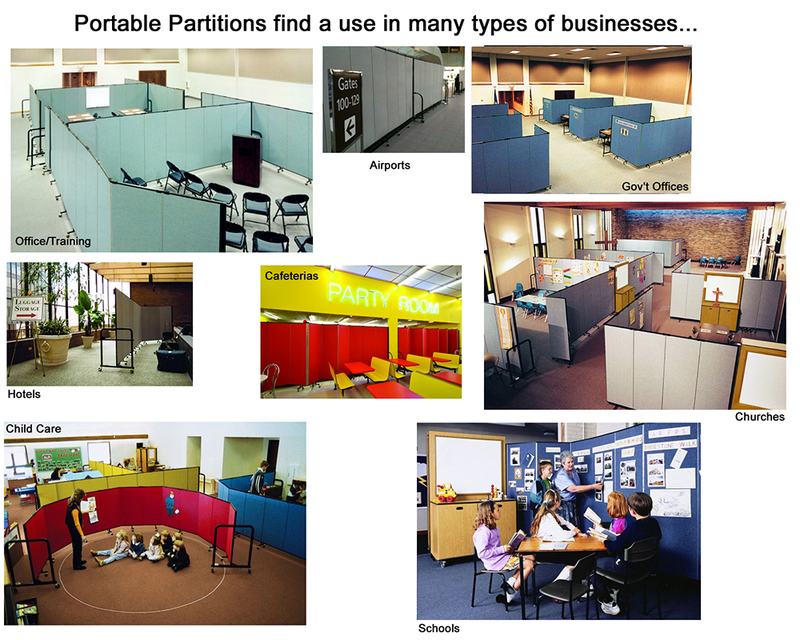 Freestanding Portable Partitions are an quick and easy way to form instant offices, training rooms, classrooms, worship areas, break rooms, privacy areas and can be also used for crowd control, for convention use or to hide unslightly areas under construction. Set up is a snap! No complicated or limiting track systems, no costly structural supports, no interference with your building's heat, light and ventilation systems. 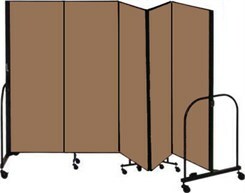 6' High x 5'9" Long Portable Partition sold above. Other sizes sold below. Made of three 22"W panels in series. Shpg. wt. 98 lbs. FREE SHIPPING! (Truck shipment -- see Terms & Conditions.) 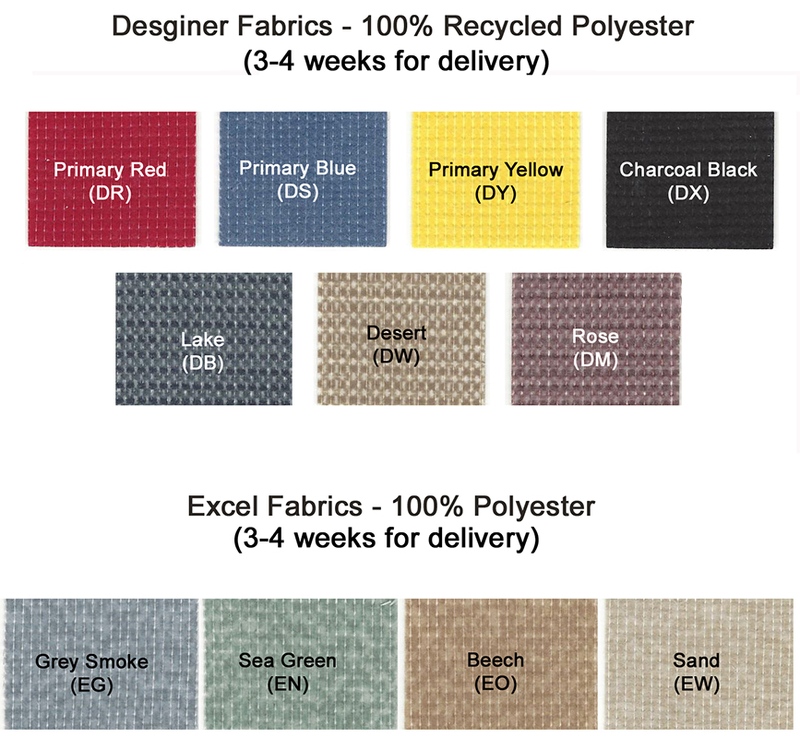 Allow 1 to 2 weeks for delivery for Quickship fabrics and 3 to 4 weeks for panels ordered in the Designer or Excel fabrics. 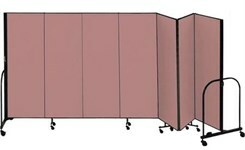 Our flexible panels may be used individually or locked together (optional -- see bottom of listing) to create any size and shape enclosure. Accordian style panels are joined in series by full length anodized aluminum piano hinges. 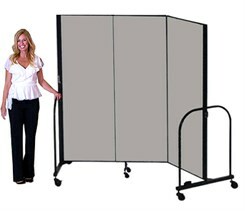 Panels pull-out to create new spaces or easily fold-up for storage. Even the largest size folds to a footprint of only 25" x 39"; the smallest length folds to 25" x 31-1/2". Panels are constructed of a rigid resin impregnated honeycomb core wrapped in 10 lb. fiberglass that is overlayed with a seamless fabric laminated to the surface. 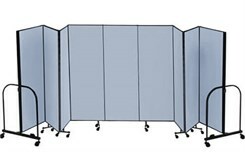 Panels are both tackable and sound-absorbing (.3 to .5 noise reduction coefficient). Tops and bottoms are trimmed with 14 gauge black painted metal frames for a finished look. Panels are mounted on heavy metal legs with adjustable height locking casters with non-marring rubber wheels. They are ready to use out-of-the-box - no assembly required! 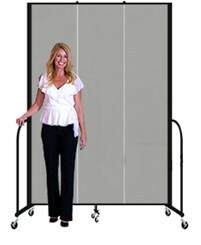 Choose from 6'H or 8'H sizes in lengths of 5'9" to 24" long! Panels are made to order in your choice of over a dozen fabrics with colors to match any decor. Quickship fabrics are available! Panels made in any of the 5 Quickship fabrics arrive 1-1/2 - 2 weeks from date of order. Other colors arrive in 3-4 weeks from date of order. Connecting bracket locks two panel systems in series. Factory installed. Order one for each panel system to be locked to another.